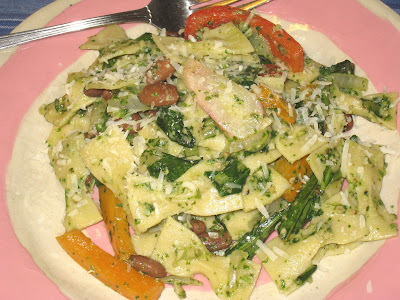 Here is one of the ways that I utilized the arugula pesto I made last week. It is significant in two ways. The first is in the pasta. 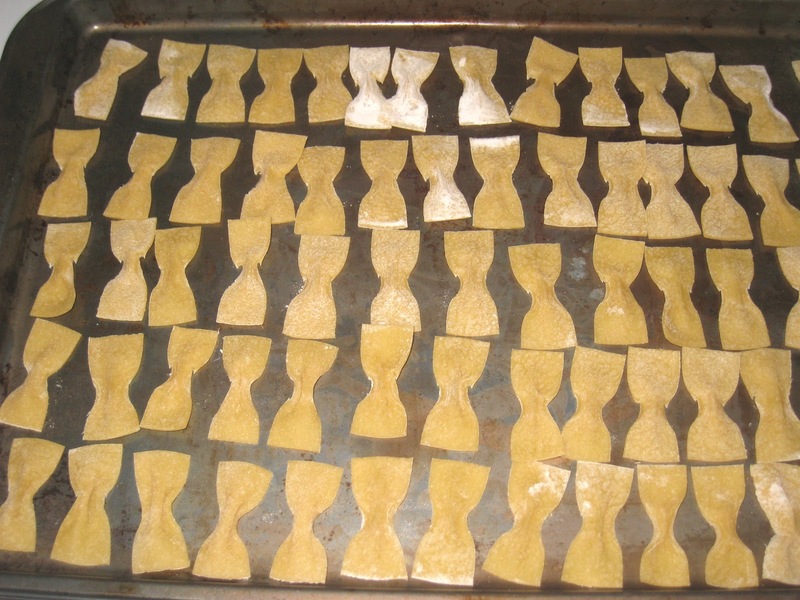 That bow tie pasta you see up there is homemade. Yep, I made it myself. It was surprisingly easy to do. I followed my usual recipe for the dough. When it came time to roll it out and cut it, I realized that I wanted something that would match well with the pesto, and in my experience that means a short pasta. I had already experienced some success making noodles, but I wanted something a little more exciting than that. I wondered what would happen if I rolled out small rectangles and pinched the sides together, as I had recently seen someone do on a cooking show; I think Iron Chef America. I rolled out the dough, cut out the rectangles, and squeezed the middle of one of the rectangles together. And got a bow tie! It was quite simple, and once I got the hang of how to grab it and squeeze for maximum effect it went quickly. I laid them out on a cookie sheet and let them dry out a little while I put the water on to boil and prepared the rest of the dish. I am inordinately happy with these little beauties, and am eager to see into what other shapes my homemade pasta can be formed. I will keep you posted! The second significance of this dish is in the rest of the ingredients. Several years ago I started a short-lived project called "What's In Your Pantry?" A friend suggested I write some posts on how to come up with ideas for meals that use what you have on hand but that don't require a specific recipe. I thought it was a great idea, and while the official project did not last long, the concept has stayed with me and has become one of the purposes of this blog. How do you learn how to cook on a daily basis without recipes, using what you have in your pantry? How do you shop to cook that way? Along with the arugula I purchased for the pesto, I bought a couple of bags of mixed baby greens, french breakfast radishes and red and orange peppers for salad. I went through the greens faster than the vegetables so I had leftovers. I also had a handful of cooked pinto beans left over from another dish I had made earlier in the week, and I had a small bunch of dandelion greens that had been intended for a frittata that never materialized. Why not just throw all of those bits and pieces into the pasta? It worked beautifully. 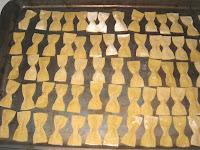 The bow ties were sturdy and wide enough to carry the pesto, and all of the vegetables added texture and additional bursts of flavor. The beans added a creamy texture and combined with the pasta to make a complete protein. As a throw whatever you have in the refrigerator together for a quick dish, it's a keeper. With a little bit of planning, it is something you could serve to guests with confidence. Put a large pot of water over high heat on the stovetop for the pasta. In the meantime, heat the olive oil in a large skillet. Add the onions and dandelion green stems and saute for 2 minutes, then add the garlic and cook until the onion is translucent. Add the peppers and the radishes and cook another few minutes until they have just started to soften. Add the beans and the wine and let simmer until the pasta water is boiling. Lower the heat if necessary to keep the vegetables from overcooking. Add salt to the pasta water and cook the pasta for 1 or 2 minutes less time than indicated on the package directions. Reserve a cup of the pasta water, drain the pasta and add it to the vegetables. Add the pesto and mix everything well, adding pasta water as needed. Cook for another 2 minutes or until the pasta is at the desired consistency. Remove from the heat and serve immediately, garnished with parmesan cheese.